While several movies of importance were made in Mexico during its silent period, it could be said that Mexican cinema wasn't really born until sound arrived to the country's filmography, as it was only when the ability to record sound became available that Mexican cinema literally found a voice of its own. 1932 saw the release of the very first Mexican "talkie", Antonio Moreno's "Santa", and its success paved the way for the further development of the Mexican film industry. With a culture rich in legends and folklore, it wasn't a surprise that fantasy and horror genres began to be explored by the young industry, and appropriately, the very first Mexican horror movie was based in what is definitely Mexico's best known ghost story: 1933's "La Llorona", the crying woman. And the man in charge of making the legend a reality was legendary Cuban director Ramón Peón. 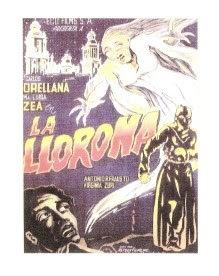 "La Llorona" begins in modern day Mexico (in the 30s), at the birthday party of the son of Dr. Ricardo De Acuna (Ramón Pereda) and his wife Ana (Virginia Zurí). Everything is fun for the kids, but Ana and her father Don Fernando De Moncada (Paco Martínez) are worried about an ancient curse that hangs over their family, in which is stated that the first son of a Moncada will die horribly as a child, victim of "La Llorona". As a man of science, Ricardo doesn't believe in this, so Don Fernando begins to narrate the dark origins of the legend, beginning with the story of Ana Xicontencatl (Adriana Lamar), a noble princess of Aztec heritage who gets romantically involved with a womanizing Spaniard named Rodrigo De Cortéz (Alberto Martí) in the times of Colonial Mexico. However the Moncada curse goes beyond the years of Spanish rule over Mexico. Adapted to the screen by two legendary figures of early Mexican cinema, Carlos Noriega Hope (of "Santa" fame) and Fernando De Fuentes (who would become a famous filmmaker on his own right), "La Llorona" is based on a story by A. Guzmán Aguilera which is essentially the narrative of the two most famous variations on the legend of "La Llorona", framed by a modern tale of mystery and horror, making technically a collection of three stories linked by the legend. Being the most famous of the two versions, the first story is the one that gets developed the most, although both versions are done in way that denounces machismo and racism as source of pain and eventually madness, although both as well fall in the trap of being overtly nationalistic tales. The framing story is done in the popular style of 30s murder mysteries, and while less deep than the two legends, it's still very entertaining. Cuban director Ramón Peón began his career in Mexico with this movie after making several classics of Cuba's silent period (like 1930's "La Virgen De la Caridad"). Like most directors of the silent era, Peón is a very visually inclined filmmaker, more focused on the atmosphere of his images than on the lines recited by his cast (which end up feeling very stagy, even for its time). As the movie is episodic in nature, each "episode" is done with a very distinctive flavor of its own, with a stagy style of period melodrama in the main segment, a grittier American style for the framing story, and a surreal minimalistic style for the final version of the "Llorona" legend (very interesting despite its short runtime). Peón barely uses special effects in his movie, but when he does they are subtle and very well done, and while kind of primitive, they fit the folktale mood that the movie carries perfectly. The cast is effective, although as written above, the style of acting is too stagy for its own sake, and the way some actors recite their lines makes one think that their lack of experience damaged the movie more than it should have. Ramón Pereda is excellent in his double role (first as Dr. Ricardo, and later as Captain Diego in the colonial segment), and is definitely the best actor in the film. as his wife, Virginia Zurí is very good too, but her character is sadly underdeveloped. As Princess Ana, Adriana Lamar has the best chance to shine in the film, but she is extremely wooden and seems to feel uncomfortable (it was her first movie) through the film. Alberto Martí is deliciously evil, and makes an excellent "villian" in his segment. Interestingly, legendary Chilean actor Alfredo del Diestro has a brief cameo in the film, and a young Antonio R. Frausto can be seen in a couple of scenes. While a very worthy first venture within the horror genre, "La Llorona" is not without its faults, and those steam mainly from the natural lack of experience (or understanding) of sound in films. The main problem is the extremely stagy style the movie has at times, which together with some average acting (sometimes too melodramatic, sometimes too wooden) makes it seems as if Peón was thinking his movie as a silent and not as a talkie. Granted, this not exactly a big problem, and its easily understandable considering the time it was made and the fact that sound was a new invention in Mexican cinema, but still, it takes a while to get used to its stagy style. Despite its problems, "La Llorona" has the seeds of the elements that in time would become the Mexican horror genre, most notably that fascination with the past (in this case, colonial Mexico) that always takes place in Mexican horror in one way or another. "La Llorona" may not be the best horror movie of the 30s, but as the very origin of the Mexican tradition of horror film-making (and one of Mexico's first talkies) is of great interest and importance. Ramón Peón's mix of horror and melodrama was a hit, and it started a brief but amazing era of Mexican horror. The way this movie showed "La Llorona" legends was very popular, and years later writer Carmen Toscano turned it into a play, which would later become the basis for the 1960's version of "La Llorona". Maybe this movie is not really perfect, as its many merits tend to be overshadowed by its flaws, however, one this is sure: its legacy is one of great importance, and one that will never die. And yet another film I never heard off...shame on me. Thanks for all these reviews of old films, because this way they are not entirely forgotten. "La Llorona" really seems like an interesting film, but I think it was never aired on TV in my country.